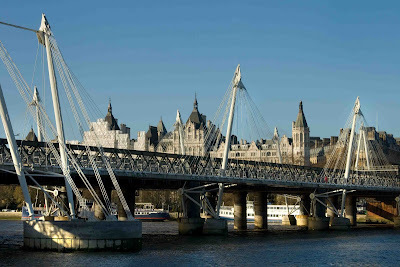 A view of one of the two footbridges that cross the Thames either side of the Hungerford Rail bridge, officially opened in 2003. Hurdles that had to be overcome in the construction period, included sinking new support structures into a busy river and avoiding unexploded WW ll bombs on the river bed. The Thames is a tidal river with the difference between high and low tide being around 8 metres. This view is from the south bank. In the background on the north bank you can see the horse guards building. Very nice shot! You have to click on the photo to have a proper look, it really deserves it. Great photo and you have caught a wonderful blue sky. That is a lovely shot - it gives me hope that I might once again see blue sky in London! A bit bigger than my bridge. I do rememeber the difference in tide heights. Love the light here bouncing off the water. I got to walk on this one just after it opened. A good lark.